For 25 years, Michel Brunet, Patrick Vignaud and colleagues have been combing the Djurab Desert in northern Chad for fossil evidence of the earliest chapter in human evolution. Now these researchers with the Mission Paléoanthropologique Franco-Tchadienne, an international collaboration, say they have found it -- the nearly complete skull of the oldest hominid ever found. The research team estimates that the cranium, fragmentary lower jaws and teeth are between 6 to 7 million years old. Anthropologists are calling it the most exciting fossil discovery in decades, rivaling the discovery of the first "ape-man", Australopithecus africanus, 77 years ago. "It's a lot of emotion to have in my hand the beginning of the human lineage. I have been looking for this for so long," said Brunet of the University of Poitiers in France in a Nature press release. The authors are calling the fossil Toumaï, a name usually given in Chad to children born close to the dry season. This week's Nature, coming out tomorrow, features Toumaï on its cover along with two articles about the fossil -- one that describes Toumaï and another that describes its environment and surrounding geology. The cranium, or skull, of the newly described Sahelanthropus tchadensis is distinct from all previously known hominids, with a small brain capacity estimated around 350 cubic centimeters, a huge browridge and a short face. Photo courtesy of the Mission Paléoanthropologique Franco-Tchadienne. 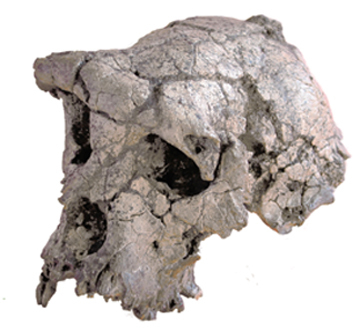 Brunet's team designated Toumaï a new species and genus of hominid -- Sahelanthropus tchadensis. A hominid is a member of the human family, distinct from chimpanzees and other apes. The cranium displays a mix of both chimpanzee and human characteristics. Writing a "News and Views" story in Nature, Bernard Wood says that from the back the fossil could pass as a chimpanzee, but from the front looks like a 1.75 million-year-old hominid. Apes were abundant 10 million years ago. And before Toumaï's discovery, the first record of hominids appeared in fossils dated about five million years ago. The human lineage diverged from that of the chimpanzees, thus between those two benchmarks. Although the authors say Toumaï is a direct hominid ancestor of Homo that may mark that divergence, Wood suggests in his article that Toumaï's "mixed and matched" features represent a small sample of taxonomic diversity during the evolution of hominids. Says Wood, "If it [Toumaï] is a hominid, then it sidelines Lucy and a whole raft of east and southern African evidence for human evolution. Even if it is a fossil ape not directly related to humans it is still the first glimpse we have had into the world of 6 to 7 million years ago and this is the world that included our ancestors." Daniel Lieberman, a professor of biological anthropology at Harvard University was shocked to see the mosaic of features on the skull. "At first I thought it was a fossil chimp when I saw it in photos, and that would be amazing since there are no fossils of chimpanzee evolution. When I actually got to see the skull, I was astonished, speechless because I realized that it was not only a hominid, but a hominid unlike what anyone would predict for something that old," Lieberman says. The most striking features of S. tchadensis are its tiny brain combined with a huge browridge, and a very short, non-snouty face -- unlike the face of a chimp or australopithecine, both of which are long, dish-shaped and very projected below the nose, Lieberman says. Echoing Wood, he says, "This has the face of Homo habilis, which appears at 2 million years ago." Brunet and colleagues date Toumaï using the rich vertebrate fossil record at Toro-Menalla site 266, the Chad locale of Toumaï's discovery. No ash layers exist at Toro-Menalla to enable isotopic dating and the sediments are not suitable for magnetism-based dating methods. The fauna at Toro-Menalla includes fish, crocodiles and amphibious mammals alongside primates, rodents and elephants. The fossil record matches two sites in Kenya, dating the site back to 6 to 7 million years ago -- a time anthropologists know little about in the context of human evolution.